The weekend to the beautiful tree lined historical country town of Orange began as club members began arriving from about 4:45 pm onwards on the front lawn of Nancy and Allen Fish's home at Milperra. Suitcases and birdcages were all lined up on the footpath as we chatted together and enjoyed a beautifully laid out and scrumptious afternoon tea that had been prepared for us by Nancy. Our luxury Hopkinsons' coach arrived a few minutes after 6:00 pm and with Warren at the helm (also our bus driver last year when the club visited Wagga), we were quickly aboard for the trip up into the wintry mountain air of the Blue Mountains and out through Bathurst to Orange. We made only one stop at McDonalds in Lithgow for a quick meal and then straight to Orange arriving at the Templars Mill Motel around 11:00 pm. After a comfortable night's rest and breakfast in our rooms, we met together for our first trip into the countryside to view Peter K's aviaries (first names only to protect members of the Orange Bird Society). 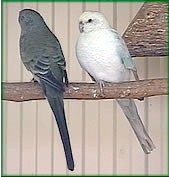 Peter had a large planted aviary for finches housing among others, Blue Face Parrot finches, Zebras, Redheads, Double Bars, Canaries, Budgies, Stars, Plumheads, Cubans, Diamonds, Jacarinis and Gouldians. 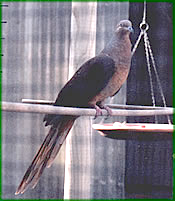 Other aviaries contained many native pigeons and doves, such as Squatters, Partridge, Greenwings, Bronzewings, Diamond and Wongas, and my favourite the beautiful parrot-like brown wood dove (also known as the brown pigeon). I say parrot-like because my first sighting of this bird was from my kitchen window as it waited in the branches of a large gum tree at the back of our house for pecking order on our seed tray. It was early morning and I could only see the silhouetted outline against the morning light. 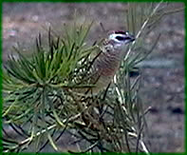 The small head and long graceful tail feathers gave it the appearance of a parrot. It was only as the bird flew down to feed from the tray that I realised it was a one of our native doves. Peter also keeps parrots such as Eclectus, Cloncurrys, Cockatiels, Easterns, Sulphurs, Major Mitchells, Little Lorikeets, Turks, Kings and Crimson Wings … and ….in the words of Life Member and Editor of our club's magazine, Des Dowling, "even a yellow Pheasant". Before I go any further, I would like to give credit to Des for his excellent note keeping and knowledge of birds. 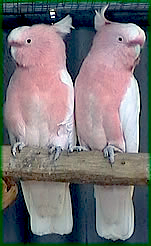 Without Des' help and article in this month's Avicultural Review, I would not have been able to name all the birds that we were fortunate enough to view and enjoy as we wandered around looking at all the aviaries we visited. We left Peter's hospitality to return to Orange to spend the rest of the morning at the Orange Bird Sale, hosted and coordinated by the Orange Bird Society. As we waited outside a young hand-reared macaw, belonging to Christine (from the Canberra Avicultural Society), entertained us by spreading his wings and fanning the air as he exercised his wings. 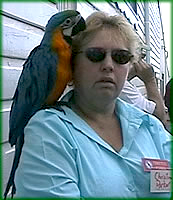 This beautiful blue and yellow macaw was very content to sit on Christine's shoulder unperturbed by the large crowd and very eager to show off with all the extra attention he was attracting. Once inside the large hall, there were plenty of sellers with a dazzling display of colourful native and introduced parrots, parakeets, a few finches and some softbills. There were a number of hand-reared birds and quite a few mutations. The National Parks and Wildlife Service were also on hand. Commercial stands offered books, paintings, magazines, and a large array of bird and aviary accessories, nesting and carrying boxes, feed, and cuttlefish. The hall was very crowded as interested buyers wandered around looking at the birds and talking to breeders and other enthusiasts. A few of the ladies wanted to go into the main streets of Orange for a little window shopping, so it was all aboard the coach leaving the men to enjoy the rest of the morning at the sale. On the way into the town centre we spotted a market so Warren dropped us off outside one of the hotels in the main street within walking distance of both the shops and the market. We wandered through the trees across the park to the market. A few of us made a short stop at the Orange Information Centre on the way to look at souvenirs and local crafts. The markets were mainly food and organic produce stalls although a plant stall attracted a couple of purchases for aviary and garden. Lunch at the pub while the men were still at the sale! After a quick lunch in the town, Warren arrived with the rest of the group from the bird sale to pick us up and head off into the countryside with Brook from the Orange Bird Society as our guide. Our first destination was Cudal and Howard B's place. 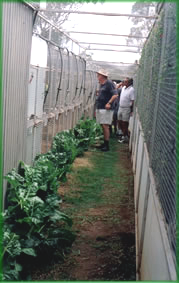 We can all gain good ideas from each other and I was particularly interested to see healthy silverbeet (a rich source of nutritious green food) growing along the safety walkways between the aviary banks. 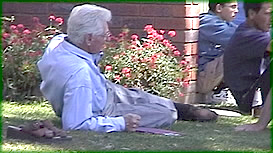 Amongst other species, Howard had Red Tailed Blacks, Kings, Golden Shoulders, Red Rump mutations, yellow Rosellas, Eclectus, green and blue Quakers, Major Mitchells, yellow white and blue Princess, yellow and normal Hooded, Crimson Wings, and ringnecks. Then to Brenden P's aviaries at Manildra. 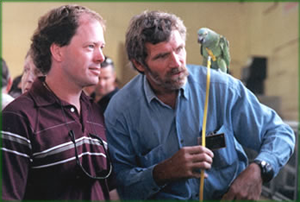 Peter's birds included Eclectus, Nandays, Eastern Rosellas and mutations, Quakers, Malabars, Red Rump mutations and Superbs amongst many others. We saw such an array of beautifully kept aviaries and contented aviary birds on this trip away that it is hard for me to remember now, but I am sure I noticed that Brenden also grows the silver beet in the safety walkways for his birds. The aviaries were well constructed and the birds well housed. Tony's house was next back along the country road towards Orange. 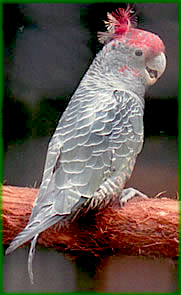 Tony mainly keeps finches such as Diamond Firetails, Red Face Parrot finches, Cordon Bleus, Stars and Cut Throats. Tony also had Canaries, Gouldians and a few Scarlets. His latest project is for a very large planted aviary the foundations already laid for this behind existing aviaries. Back into Orange again to Jack's house in amongst the tree lined streets and beautiful garden shrubbery of well-planted gardens on the suburban outskirts of Orange. Jack's aviaries were well constructed and blended well into his very pleasant, large back garden with its established shrubs, trees, and green lawn areas. 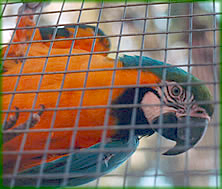 Jack's aviaries housed a variety of different species from finches through to the larger parrots. He had Diamond Firetail and Fire finches, Gouldians, Canaries, Budgies, Cockatiels, Scarlets (normals and blues), Bourkes, Redrump mutations (that included some very bright yellows), Turks, Kings, and Major Mitchells. 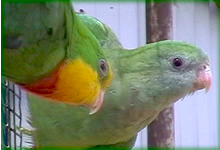 Next, to Rod's house and large aviaries housing Macaws, Major Mitchells and Eclectus. There were also Rosellas, Turks, Scarlets, Redrump mutations, white and blue Princess, Port Lincolns and Twenty-Eights (both cinnamon and blue). I tried to take some photos of the Macaws but they were so curious about the camera I could not trick them. I tried just hiding the camera behind my back and only producing it when I was ready to take a photo. However, as soon as they saw it, they flew straight down and got as close as possible to see what was going on. It was a lovely afternoon with bright blue skies and warm Australian autumn weather. We enjoyed all of the aviaries and birds that we were privileged to see and thank all the members of the Orange Bird Club for their hospitality. We then returned to the Templars Mill Motel for a late afternoon rest to refresh and change before dinner at the Orange Bowling Club arranged for us by the Orange Bird Club. We enjoyed meeting and talking with other avicultural enthusiasts from other clubs over a delicious selection from a Chinese buffet and equally delicious desserts. 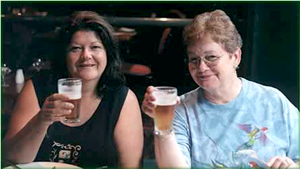 After the meal, some returned in the coach to the Templars Mill and a casual drink before retiring and others stayed longer at the Bowling Club to walk the several blocks back through the town back to the motel. It was all aboard the bus at 8:00 am on another beautiful sunny autumn Sunday morning. Morrie was aboard as our guide and it was straight to his house to see his aviaries and well kept birds. 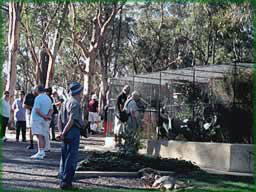 Morrie's aviaries covered a very large area of land to the rear of the house with lots of variety including lots of finches and doves as well as parakeets and larger parrots. A pair of very friendly Gang Gangs attracted a lot of attention as they feasted on the red berries of the hawthorn and firethorn branches that Morrie had for them. Morrie also had many Neophemas such as Turks, Scarlets and Bourkes, and their mutations. 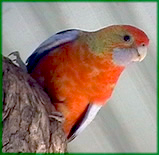 Also Eastern (including yellow headed) and Western Rosellas, Twenty-Eights, Redrump mutations, Crimson Wings, Major Mitchells, Alexandrines and Budgies. His large planted finch aviary housed Double Bars, Redheads, Emblemas, Parsons, White Longtails, Gouldian mutations and Diamond Doves and more. As we made our way out of Orange towards the historic gold mining town of Lucknow and Peter N's aviaries, we were privileged to learn from Morrie's extensive knowledge of the area. Orange is about 900 metres above sea level situated close to Mt Canobolas, an extinct volcano about 18 kms by road to the south-west of Orange and approximately 14,000 metres above sea level (the highest point west of Mt Kosciusko in the Snowy River Mountains area in the south and nothing higher west until South Africa. Orange has a population of approximately 40,000 with 60,000 including surrounding areas. It is a city noted for all its trees with several large parks and many street and garden plantings of a great variety of introduced and native trees. Morrie said that this was largely because Orange has a higher than average rainfall in relation to other country towns as far west as Orange and that even during the extreme drought conditions of recent summers, Orange remained green. The local and surrounding areas of Lucknow still maintain open cut and reef gold mines following the reef from Lewis Ponds in the North-East to Cargo in the South West, with the biggest being Cadia (which is the largest in Australia next to Kalgoorlie). Gold from the open cuts brings approximately $(AUS)180 per ounce and $(AUS)120 per ounce for reef gold. Millions of dollars worth of gold have already been mined in this area and it is estimated that there is still enough gold to sustain the town for at least another 25 years. $1.5 billion has been invested in the mine and this has made a big difference to Orange, which continues to get bigger with increasing house prices. The old diggings are now mainly filled with water. The original reef extends from Hill End, Ophir and Lucknow through to Cargo, through new and old basalt and clay bands. The area back of Bathurst and over towards Oberon is granite country. As far as temperatures are concerned, Bathurst is warmer than Orange and birds tend to go down a month earlier. Orange can get cut off by ice during the coldest months. Morrie said that some breeders have electrically wired underneath the nest boxes using 25-watt refrigerator globes to help to keep the birds warm during winter. We saw examples of this at Peter N's house at Lucknow. Peter keeps a variety of birds including parrots, lots of lorikeets, cockatoos and finches. He had Red Collars, Scalies, Dusky and Chattering Lorikeets. Budgies and Hooded parakeets and mutations. Eastern Rosellas plus strong yellow mutations. Eclectus, Red Tail Black Cockatoos, Gang Gangs, Major Mitchells and Crimson Wings, and many many more. Peter and his family hosted a fantastic morning tea for us. It was lovely warm sunny morning with lots of friendship and an almost overwhelming amount of delicious food. A big thank you to Peter, Debbie, Betty and Ray, for their wonderful country hospitality. From Peter's house, we headed east to Bathurst and Daryl W's house with his very unusual aviary setup, set into the side of a hill. Daryl had well constructed aviary banks extending across the back of his property and sitting higher than his house. Daryl had many beautiful and colourful birds such as the Sun Conures, Maroon Belly Conures, Green Cheek Conures and Janday Conures. Moustaches, Scarlets and Slatyheads as well as lots of Redrump mutations. We left Daryl and his family and head out towards the Mt Panorama motor racing track south of Bathurst to Laurie A's house. We walked up past the Cotoneaster and pyracantha type berry bushes that lined the driveway and past the rose garden laid out in the circular drive as we approached to the house. Laurie had so many aviaries and beautifully kept birds, we almost needed a map to know which way to go first and to be able to see them all. There were Bourkes, Hooded, Eclectus, Sun Conures, Western Rosellas, Mulgas, Princess Parrots (greens and blues), lots of beautiful Indian Ringnecks, Quakers, Moustaches, Plumheads and Slatyheads, to name just a few of the birds that we saw as we wandered around the many aviaries and well kept birds. After wandering around all the aviaries, we gathered on the lawn for a barbeque lunch provided by Laurie and his family. It was a lovely day in the warm sun and a chance to rest and enjoy each other's company. Thank you Laurie, it was a perfect end to a perfect weekend. After lunch it was time to say goodbye to everyone from the Orange Bird Club and to climb aboard the coach once again for the trip home. As we travelled up through the mountains we saw a lot of the areas that were burnt out by the bushfires that went through these areas shortly before Christmas. The new growth of the tree ferns on the floors of charred eucalypt forests painted a striking landscape compared to the usual lush growth of the mountain areas in this region. As we passed through Medlow Bath we saw how close the fires had come to the Hydro Majestic. However, a large historical home next door had not been so lucky. We all thoroughly enjoyed the weekend and I am sure there were a few of us who caught a quick catnap during the afternoon as Warren drove us all safely back home to Sydney. A big thank you to Allen for organising the trip and helping to make sure that everything went smoothly. Also of course, a big thank you to Maurie and all the members of the Orange Bird Club, for hosting the weekend, for their country hospitality and for making this weekend possible in the first place.